Register today to attend all or part of this day of learning & conversation – in Portland on April 9 & in the Columbia Gorge April 29-30. 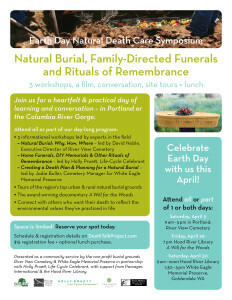 Natural Burial, Family-Directed Funerals & Rituals of Remembrance: 3 workshops, a film, conversation, site tours & lunch. Attend all or part of our day-long program in either location. Reserve your space today. Learn more about the workshops, site tours, film screening, schedule, presenters, and registration details. Download a flier.